The Turbomeca Palouste is a French gas turbine engine, first run in 1952. 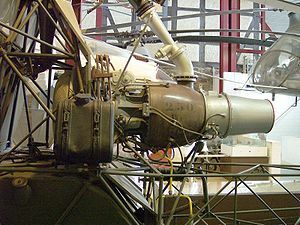 Designed purely as a compressed air generator, the Palouste was employed for helicopter rotor tip propulsion but was mainly used as a ground-based aircraft engine starter unit. Designed and built by Turbomeca, the Palouste was also built under license in Britain by Blackburn and Rolls-Royce. Originally conceived as an aircraft ground support equipment starter gas generator it was also used as propulsion for the Sud-Ouest Djinn and other tip jet powered helicopters. The Palouste was a very simple unit, its primary purpose was to supply a high flow rate of compressed air to start larger jet engines such as the Rolls-Royce Spey as installed in the Blackburn Buccaneer (this aircraft had no on-board starting system). Air from the centrifugal compressor was divided between external supply (known as bleed air) and its own combustion chamber. Several British naval aircraft were adapted to carry a Palouste in a wing mounted pod installation to facilitate engine starting when away from base. A novel use of a surplus Palouste engine was its installation in a custom-built motorcycle known as the Boost Palouste. In 1986 this motorcycle broke an official ACU 1/4 mile speed record at 184 mph (296 km/h). The builder modified the engine to include a primitive afterburner device and noted that pitch changes due to braking or acceleration caused gyroscopic precession handling effects due to the rotating mass of the engine. Turbomeca Palouste Pictures and Turbomeca Palouste for Sale.